A delegation of around 50 developers and investors were given an in-depth look at the wealth of opportunities available in Crawley during the second highly-successful Investor Tour. 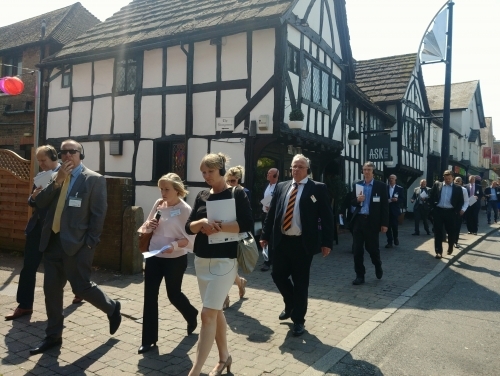 Working on behalf of Crawley Borough Council, and Partners London Gatwick Airport and SHW, White Label facilitated the event from start to finish – showcasing the West Sussex town on a gloriously sunny spring morning. Attendees gathered for a networking breakfast at the impressive town centre offices of Grant Thornton, where the Leader of Crawley Borough Council, Peter Lamb, welcomed guests with an opening address. Steve Cresswell, Director at Kier Construction Southern, who support the event, also explained why both he and Kier are so invested in the Borough. The delegates then boarded the coach outside the office and embarked on a detailed route through the town and out into the Manor Royal Business Park – the biggest business park in the Gatwick Diamond area and one of the biggest in the UK. The coach tour was led by Adam Godfrey, Senior Partner at SHW, and Manor Royal BID Executive Director Steve Sawyer. Delegates heard about the companies and businesses who currently work in Crawley – taking full advantage of its excellent location next to Gatwick Airport and a short train ride from central London – while information was given on the opportunity sites available across the area. A coffee break was laid on at the recently completed and fully refurbished Grade A office space at Endeavour, on Manor Royal, where further speeches were given. Steve Sawyer explained the benefits received by the 500 companies and 30,000 people currently working on the business park, a case study was presented by Phil Pakianathan, from Permasense – one of town’s huge success stories – and Alison Addy, Gatwick Airport’s Head of Community Engagement, and Lisa Lewis, Head of Strategic Planning, outlined the future plans of the airport, including the possibility of adding a second runway. The group then gathered back on the coaches and returned for a walking tour of the town centre, under the guidance of Lynn Hainge and Clem Smith from Crawley Borough Council. From there the tour went past Crawley College, where Paul Rolfe highlighted the Colleges plans for development, and down to the County Buildings, where Marie Ovenden, from West Sussex County Council – who own the site – talked about their planned redevelopment. The event was wrapped up at The Platform. Here delegates heard from Natalie Brahma-Pearl, Chief Executive of Crawley Council, and Councillor Peter Smith who thanked everyone for their attendance. Guests were then left to enjoy the wonderful views from the top of The Platform before ending their morning with further networking over a buffet lunch. Thanks to White Label for permission to synidcate this article.